I was very excited to explore Vietnam. So far, I had only heard well about the country. And after the tourist overrun in Thailand, it must be more quiet and relaxed there. Of course, I applied ear ly in advance for my visa and I received my letter of approval shortly after. All I had to do was to pay for it and then I could enter the country and travel around for the next 30 days. 25 USD or 560.000 VND. Neither did I have any Dollars nor any Dong with me. If everybody needs to pay for his visa after his arrival, I was thinking, there should certainly be an ATM in the entrance hall. Well, there was not. They seriously only accepted cash. How is that possible? They want money to enter the country and at the same time, they do not accept credit cards nor do they put an ATM close by. The closest one was outside in the arrival hall of the airport. Are they kidding me? How should I get there without my visa? Lucky me, there was a very kind stranger who lent me the money. Otherwise, I could not have entered the country. What a start! Thank you dear stranger! You totally saved my trip! I will never forget that! After traveling for such a long time, I am sort of fed up with cities. I am not really interested in exploring them anymore. Instead, I like to look out for cozy little, delightful cafés where they serve delicious coffee, or hidden vegetarian places where I can enjoy a variety of food and relax and hang out at the same time. 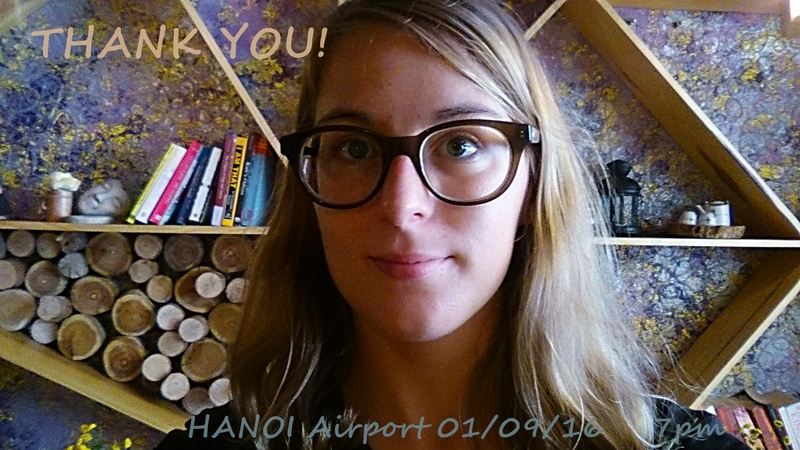 Hanoi was the perfect spot for doing so! First, it is paradise for all coffee lovers out there. Weasel and Kopi Lowak coffee all over the city. Vietnamese and Indonesian coffee have certainly an unforgettable and unique taste that just needs to be enjoyed as often as possible. Yummy, yummy! Second, there are quite some vegetarian and even vegan places. My two favorite ones were ‘Jalus Vegan Kitchen and Café’ and ‘Zenith II Yoga and Café’ where I even attended a yoga class. Up to then, I had not realized how much I actually missed doing yoga. It had been too long… Yoga is such a pleasant activity for mind, body and soul. In Vietnam, I have to do it as often as possible. As I mentioned before in some of my other blog articles, most of the times I do not really inform myself about the country or let alone the monsoon season before I go there. Unsurprisingly, I had no clue North Vietnam had an actual winter. I thought it was hot or at least mild all year long. Well, I was wrong. When I got from Bangkok to Hanoi, I could already feel a temperature difference. Honestly, the mild temperature in Hanoi was very pleasant. Finally, I was not sweating all day long anymore. Unfortunately, one day later the temperature dropped a couple of degrees… All the sudden, I had to put on jeans, wear socks and even my rain jacket. What was going on? Good thing I still had those clothes with them. I had been thinking for a while to send everything back to Germany since I was not using it at all. Until I got to Hanoi. Nevertheless, Cat Ba and especially Halong Bay was beautiful. I went on a boat trip where we crossed fishing villages, enjoyed the breathtaking scenery of limestone cliffs, kayaked through tight caves and explored hidden little beaches. Even though it was too cold for snorkeling and swimming, the whole day was a delight! I had a wonderful time. The next day, I went on a motorbike trip together with an Italian traveler that I met on the boat trip. Together we were exploring the island. We went to the Hospital Caves that are, unfortunately, a huge disappointment; to the National Park, in which we hiked*, rather climbed all way up to a beautiful, beautiful viewpoint; sneaked into a closed grotto, which turned out to be one of the prettiest hidden natural beauties I have ever seen; kept driving around in the rain just to see as much as possible. All in all, it was a great day! Le Pont Bungalow Hostel – highly recommendable! I love the Vietnamese flag! Let the boat trip begin! a hell lot of fun!!! Again, when I arrived in Vietnam, I had no clue how much time it would take to travel from one place to another. It was not much of a surprise if you consider how long this country is… It took me 20 hours (!!!) to travel from Cat Ba to Hué, my third stop in Vietnam. At least I spent most of the time in a sleeping bus, in which you could actually lay down and sleep. I had never traveled in such kind of a bus before. It was surprisingly comfortable. However. I was only staying in Hué for one day to visit the Citadel, which reminded me a lot of the Forbidden City in Beijing, just in a less good shape as you can see on the pictures. Apart from shopping and enjoying the pretty little town at night, I was biking around exploring the area and taking yoga classes again. Honestly, it was the best yoga class of my entire life! I have always enjoyed yoga, but this one class was exceptional! I truly hope I can find a similar class somewhere else in this country! It was a delight! Colorful lanterns and lamps everywhere! Of course! What do you think?! been to in my life!!! Going from Hoi An to Nha Trang took quite a while. As usually, I had to take a sleeping bus to drive overnight to my new destination. Vietnam is a very long country; the distances between some places are not big, though the infrastructure is very poor. Another ride in the middle of the night. Another night without a good night sleep. This time though it was totally worth it. We arrived in the middle of the night in Nha Trang. My hostel was still closed. I decided to go to the beach and watch the sunrise. It was gorgeous! Best idea ever! So many local people hanging out there, doing morning sports, enjoying the breathtaking view of the first sunrays glimmering through the far away mountains. This was one of those moments that I will never ever forget in my life. Being at the right place at the right time. Damn, that feels good!!! Could it possibly get better than Nha Trang and Mui Ne? Not really. There I found everything I needed. Breathtaking landscape, the sea, the beach. What else could you ask for? Nevertheless, I am still a traveler who wants to explore as much as possible of a country. Some other backpackers told me about the Mekong Delta and the famous floating market there. I had not read about it, but okay. If they say so, I have to check it out, of course. I do not want to end my article with my a bad experience I made at the end of my trip. So let’s talk about something I really liked about this country! Vietnam is a paradise for every foodaholic. Travelers I met told me how they were trying dog, bugs, rats, pig brain and how good everything tasted. Luckily, Vietnam also has some dishes that vegetarians can enjoy. Every place I visited had vegetarian restaurants and cafés. It was a delight! In big cities like Hanoi or Ho Chi Minh, they even had a couple of vegan places. I enjoyed every single visit and every single bite of some quite experimental creations. Have you ever had a spinach shake to drink? Or an avocado mango salad? Definitely worth a try! Holla…das sind ja echt colle Erlebnisse…supper die Bilder und eine gans anderer Welt ..das ist einfach leben und leben lassen..toll…einfach toll….